So how do the two link? In this article, I discuss how a non-surgical treatment can be an option for those who have experienced post-surgery complications. Managing a surgical complication is an extremely advanced procedure and should only be performed by those experienced in NSR treatments. A saddle-nose deformity is characterised by a loss of nasal dorsal height often described as a ‘pug nose’ or ‘boxer’s nose’, both of which refer to various degrees of nasal dorsal depression. Recent advancements in medical technologies have led to a surge in demand for non-surgical rejuvenation procedures. Dissatisfied patients seek a myriad of techniques to restore nasal aesthetic such as botulinum toxin, threads and hyaluronic acid injections.13 All of these minimally-invasive facial aesthetic procedures are very frequently requested by a growing number of well-informed patients owing to the reduced risk of adverse events, decreased level of pain, and virtually negligible downtime compared to surgery.14 Non-surgical correction is an option for the external aesthetic of the nose by reducing the appearance of the characteristic saddling and collapse. This case study involves a 24-year-old teacher, who previously underwent a cosmetic rhinoplasty in Turkey. She came in for a consultation two years following her rhinoplasty, with concerns about the appearance of her nose and dissatisfaction with her result. Her immediate post-operative recovery was unremarkable and she had been reasonably happy with her result. Around six months’ post operatively, however, she began to notice that her nose was losing its smooth lines and the bridge was starting to collapse. This was mostly observed from the view of her profile. She felt that the appearance of her nose had an impact on her self-esteem and confidence and that it was a noticeable problem because she felt that people would always look at her. She felt it also bore the hallmarks of a ‘botched’ rhinoplasty and this carried with it certain social stigmas. The patient had considered more surgery to revise this, but was too afraid of the process, recovery and unpredictable result. She therefore decided to live with her result, until she found out about the possibility of non-surgical repair. On examination, her nose showed the characteristic signs of a saddle deformity. The anterior aspect showed an inverted V and a bulbous tip. The side profile demonstrated a collapsed bridge, and an up-turned tip. The skin of the nose was soft and not exhibiting excessive scarring or tethering to the underlying tissues. There was no evidence of venous congestion or vascular compromise in the skin. Upon clinical assessment, the patient was found to be a good candidate for non-surgical correction using hyaluronic acid dermal fillers. The patient’s suitability for this treatment was assessed; she had no contraindications to dermal filler injections. Based on my extensive experience in non-surgical repair of surgical complications, I was confident to recommend this treatment to the patient. The treatment was described to the patient and full, informed consent was obtained and high-quality images were taken. It was explained to the patient that the nose would appear slimmer and more contoured from the front profile. The existing abnormal shadows and inverted-V deformity would be improved. The side profile would also show a marked improvement in the overall straightness and smoothness. 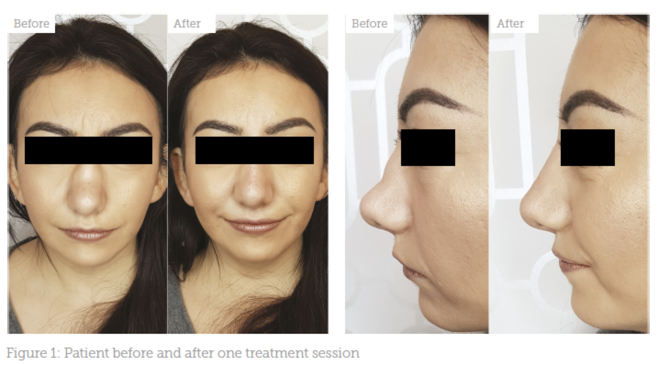 It was also explained that any treatment performed should avoid detrimental pitfalls such as overcorrection, which would make her nose appear larger or wider and potentially give her a worse aesthetic outcome. We were careful not to overpromise a completely straight bridge, which is limited by the elasticity of the skin and existing scar tissue. It is always more reasonable and realistic to describe the likely results of the treatment as an improvement and a softening of the existing problem, but not a complete eradication or reversal. The main risks of the procedure were explained, including infection, bleeding, bruising, and erythema, which may last weeks or even months in the worst cases. The most important issue to clarify to the patient and warn them about was that of vascular compromise of the skin leading to potential necrosis.16 As mentioned above, this is always a quoted risk in non-surgical rhinoplasty and even more so in patients who have had surgery previously. 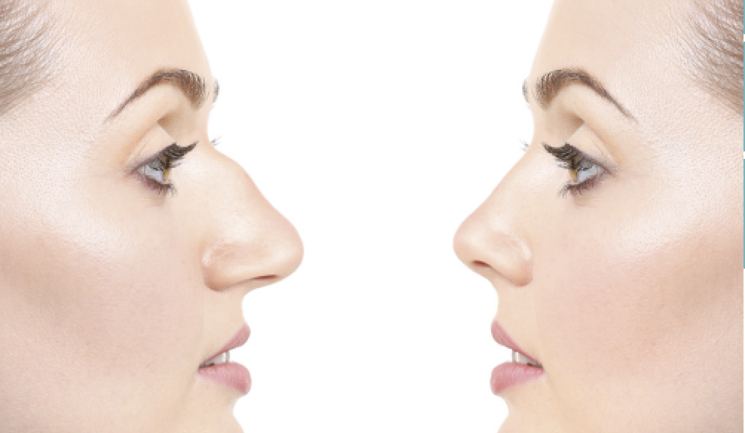 In my experience, patients who have previously undergone surgical rhinoplasty can exhibit noticeable differences in the behaviour of the skin and soft tissues of the nose. The degree of scarring in the skin and cartilage can be variable and this can lead to a nose that is quite inflexible and skin which is thin and tethered. Scarred, post-surgical tissues, especially at the tip of the nose, usually do not accommodate the significant expansion that may be desired. Attempting to do this against the limits of the tissues can be disastrous, with risks of excessive tissue pressure and vascular occlusion. Careful assessment and appreciation of these factors are essential to providing safe and satisfactory results. Previous surgery will always have disrupted the natural blood supply to the skin and it is imperative that the practitioner accounts for the altered, unpredictable and likely compromised vascularity of the tissues before attempting to inject. A very meticulous injection technique and product selection are essential, as well as a heightened level of awareness to identify impending vascular complications, which must be treated immediately to avoid necrotic consequences. 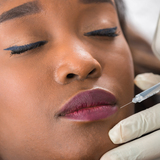 Correction of surgical rhinoplasty complications using dermal filler injections carries significant risks and should be reserved for practitioners who are highly experienced in this particular treatment and able to deal with any complications. Treatment was carried out using a serial micro-bolus technique using a 30 gauge needle. A needle is preferred in these patients for two main reasons. Firstly, in my personal experience, a needle offers more precise placement of the product than a cannula. The second reason, which is especially pertinent in post-surgical patients, is that the degree of scarring in the nose can obliterate the natural tissue planes17 and in my experience, can prevent the smooth glide of the cannula, while forceful advancement and blunt dissection can cause more localised trauma and pain. Injection depth was aimed at the sub-SMAS level in order to augment the bony and cartilaginous skeleton of the nose and affect the external changes, without jeopardising the vascular structures. A selection of three products were used for this patient. For the purpose of dorsal projection along the bridge of the nose, Teosyal Ultradeep was chosen for its localised lifting ability and minimal propensity for causing generalised volumisation, which is undesirable in the nose. This particular filler is my product of choice and is ideal for achieving good projection and sharp contour in the bridge of the nose. In areas of thinner skin such as on the lateral aspects of the nasal bridge, Teosyal RHA4 was chosen for its localised strength in tissue lifting, as well as a degree of stretch which would prevent visibility of the filler under the thinner skin. Finally, a superficial injection of Teosyal RHA2 filler was also used to smoothen any minor contour discrepancies that remained. All injections were performed by injecting the smallest aliquots possible, always injecting centrally, slowly and at minimal pressure, using a small calibre needle. A total of 1.6ml of product was used in a single treatment session. The treatment time was 25 minutes and there were no immediate or early complications seen. The patient experienced a minor degree of erythema and swelling at the site of treatment. A single application of fusidic acid ointment was used to cover her nose for prophylaxis. Overall the patient was extremely satisfied with her non-surgical rhinoplasty results, which showed a visible correction in the saddling of her nose. The patient was given post-treatment instructions to avoid exercise and strenuous activity for one week and avoid wearing makeup on the area of treatment for 24 hours. She was given an emergency contact number and instructed to monitor the area and report adverse changes, such as worsening pain, bruising or discolouration of the skin or any other concerns. Results would be expected to last between nine to 12 months. This level of close assessment before treatment, meticulous technique and careful product selection, followed by cautious post-operative observation and clear patient instructions are essential elements in maintaining safety standards in this patient group. In an era where rhinoplasty has become popular, it is more important than ever to introduce non-surgical options that address post-rhinoplasty complications and avoid the need for complex secondary surgery where possible. For patients who are reluctant to undergo surgical intervention, NSR is a great choice and a viable alternative. However, it must be stressed that this procedure is associated with high risks of complications, especially in inexperienced hands. 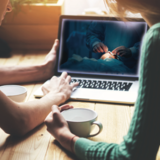 It is imperative that the practitioner is experienced in NSR techniques before embarking on the treatment of post-surgical complications. Careful patient selection, cautious management of expectations, delicate technique and immediate and effective complication management are essential for the success of this procedure. Disclosure: Mr Harb is currently associated with Teoxane UK as a KOL and international trainer. Sang Min Hyun, MD; Yong Ju Jang, MD. “Treatment Outcomes of Saddle Nose Correction”. JAMA Facial Plast Surg. 2013;15(4):280-286. Foda, Hossam MT. “challenging Problems in Rhinoplasty.” Facial Plastic Surgery 32, no. 04 (2016): 331-332. Schuster, Bernd. “Injection rhinoplasty with hyaluronic acid and calcium hydroxyapatite: a retrospective survey investigating outcome and complication rates.” Facial Plastic Surgery 31, no. 03 (2015): 301-307. Raina Zarb Adami. “Non-surgical rhinoplasty: key indications and considerations for nasal augmentation”. Journal of Aesthetic Nursing, 5, 5, (227), (2016). Daniel RK. Rhinoplasty: septal saddle nose deformity and composite reconstruction. Plast Reconstr Surg. 2007;119(3):1029-1043.